BHVR was previously a Canadian non-profit corporation, however, despite our efforts, we were unsuccessful in raising significant sums of money for victims of Boko Haram. Therefore at our AGM in February 2016 the membership decided to dissolve the corporation but maintain this website and the informational functions of BHVR . We continue to encourage our readers to donate generously to those NGOs, international and national, that are operating effectively in the region. Our Partners page identifies several of these charities. The latest materials are added immediately below. Thus it is best read from bottom to top if you visiting for the first time. This page has been updated and now covers 15 months of Boko Haram violence, the last four of which (Nov. 2018 – Feb. 2019) demonstrate that Boko Haram is very far from having been “fully decimated”. Not only has Boko Haram been gathering strength but its violence is now directed more and more against the Nigerian military. Meanwhile vast areas of Borno state remain a no go area for NGOs. Your webmaster has been feeling progressively more futile as the years go by with little obvious change in the overall state of terror and human misery in Northeast Nigeria and adjacent parts of Niger, Chad and Cameroon. I have decided that the most useful thing I can do is to assist the many millions of victims, direct and indirect, of Boko Haram to understand what is going on around them. I have therefore analyzed and drawn inferences from the past year’s reports on the insurgency’s bombings, assaults and other violences. For example, Boko Haram’s range of action has been reduced. On the other hand over the past six months attacks on the military have been building in northernmost Nigeria and southern Niger, and these have been accompanied by looting of tanks, other heavy weapons, munitions and other matériel. Knowledge of developing trends may not be power, but even a little light on the present situation is better than none. I have no illusions that the unfortunate residents of, say, Dalori 2 IDP camp near Maiduguri have access to this website, but you have and can perhaps help in disseminating information to those who can benefit from it. Click here to go to the page. The BBC News (http://www.bbc.com/news/world-africa-42735414) reports that Boko Haram mounted 150 attacks in 2017, killing over 900 people. Both figures must be considered underestimates since reporting from this region is so thin and often poor. Neither do they take account of the many collateral deaths resulting from other forms of violence (see below), starvation and disease. At least two million are known to have been displaced. Besides in Nigeria, mainly in its northeastern states, Boko Haram has struck in Cameroon’s Far North, Niger’s Diffa region and Chad’s Lac region, with 109, 32, 2 and 7 attacks respectively. On the map below the blue circles represent assaults involving numbers of insurgents, while those in brown are less labor intensive bombings. Surprisingly, the bombings are less widely distributed than the assaults, the latter occurring over the whole of the affected area. It is clear that, despite Nigerian claims of victory, the insurgents are still capable of mounting significant assaults in Borno, Yobe and northern Adamawa states, and across national frontiers. It is not, it seems, known which factions of Boko Haram are responsible for which attacks, nor from where are they now getting their money, arms and supplies? Is the intelligence lacking or being kept secret? at least 100,000 Nigerians living in remote border areas back to war, displacement, and destitution in Nigeria’s Borno State. At least 4,402 are known to have been deported in the first seven and a half months of 2017. In carrying out these deportations, Cameroonian soldiers have frequently used extreme physical violence. Some, including children, weakened after living for months or years without adequate food and medical care in border areas, have died during or just after the deportations, and children have been separated from their parents (Human Rights Watch report of 27 Sept. 2017). The residents of the massive UNHCR Minawao camp suffered severe violence. Look for this camp, easily visible on Google Earth at 10º 33’ 14” N, 13º 51 49” E, to grasp the scale of the problem. For many years Cameroon has had a “reputation as a generous refugee-hosting country”, having taken in thousands of refugees from Chad, the Central African Republic and elsewhere when other countries would not. The violence associated with extremism is infectious. Scott MacEachern has just published a book, Searching for Boko Haram: a history of violence in Central Africa, that demonstrates that Boko Haram “acts within century old [ecological and political] systems of regional border violence”. In it and in an article published in the Washington Post of 20 February, 2018, he discusses how “Boko Haram’s activities echo those of earlier smugglers, Islamist militants, and slave raiders”. Within today’s social systems in the Lake Chad Basin, young men without money or connections find little possibility of social mobility. It is almost impossible to find a legitimate, well-paying job, and so they are trapped on the margins of society, scrambling to exist from day to day. In ordinary circumstances, such young men will never be able to afford a wife’s dowry, enabling them to become a baaba saré — in Fulani, “head of a household.” Without a family, they will be trapped in perpetual adolescence, not accepted as grown men even in their 30s and 40s. For these reasons “Boko Haram leaders dole out women as rewards to their followers” — and need to capture young women and girls, usually in small numbers but sometimes in bulk as in Chibok in 2014 and, less successfully, in Dapchi in Yobe state on the 20th of February. Hamman Yaji, chief of Madagali, was doing exactly the same a century ago — only now Madagali is a preferred target of Boko Haram bombings. Both Hamman Yaji and Boko Haram slaughtered men, less easy to control whether physically or through indoctrination. As Hilary Matfess wrote in another Washington Post column on 26 April, 2016, “… Boko Haram isn’t just a violent scourge. It attracts members because it offers a kind of normalcy in a region effectively abandoned by the state, including commerce, marriage, social services, identity, and belonging.” This may be something of an overstatement, but until Nigerian governments act on such insights, Boko Haram will continue to bring famine and misery to the lands it infests. We end with good news. According to the Guardian, Nigeria recently released 475 people allegedly affiliated with Boko Haram for rehabilitation and a further 468 suspects were discharged. In January we learned from the BBC that “Nigeria’s military says it has released 244 ‘repentant’ Boko Haram suspects who have undergone rehabilitation.” It is to be hoped that this reflects a national and vitally important concern for reconciliation rather than the sorry state of Nigeria’s system of justice. Some had been held without trial since 2010. Troops of the 192 Task Force Battalion of 26 Task Force Brigade of Operation Lafiya Dole at about 8.35 p.m. on Tuesday, 10th October 2017 displayed their fighting prowess to dislodge the onslaught by successfully repelling a Boko Haram terrorists’ attack at their (military) outpost from the Yamteke axis of Gwoza Local Government in Borno State. The troops utilising heavy fire power and acts of bravery dealt a decisive blow on the terrorists who attempted to infiltrate their outpost with improvised explosive vehicles and persons bearing improvised explosive devices. “the ensuing fire fight, troops inflicted heavy casualty on the terrorists, repelled the attack on their location, neutralised 15 terrorists, captured one Panhard Vehicle Blinde Leger [Light Armored Vehicle], large caches of various ammunition, destroyed one Toyota Hilux pick up truck mounted with anti-aircraft guns and one gun truck. The success of the Nigerian forces was not total and there are reports that after the attack NGOs fled from Gwoza. The assault was mounted from what can now be identified as a stronghold rather than a refuge in the Gwoza Hills. The Nigerians’ success in capturing of a LAV, presumably spoil acquired by Boko Haram from one of the surrounding Francophone countries, Niger, Chad or Cameroon, plus other equipment and ammunition, shows that the insurgency is indeed resurgent in this part of Nigeria. Any doubt about this was dispelled by Boko Haram’s ability to mount, less than a month afterwards, on the 6th of November and following two suicide bombings on the previous day, another substantial assault on Gulak, a Margi town that is the seat of the Madagali Local Government Area. This began in the evening. It appears that local vigilantes and hunters were unable by themselves to fight off the attack, but that they were quickly reinforced by an army unit which repulsed the insurgents leaving — according to one source — 42 Boko Haram dead and only one resident shot. About a week later two villages located between Gulak and Madagali were again attacked by night but were driven off by Nigerian troops and local allies. And on the 21st of November suicide bombers killed at least 20 worshippers at a mosque in Mubi with over 40 others wounded. Nor has recent Boko Haram activity been limited to Adamawa state. According to the Nigerian Vanguard On November 25th, a forward operating base in Magumeri, near Maiduguri, was attacked by a large force of insurgents that moved into the town to loot and destroy before being eventually repelled. Three soldiers were killed and 6 wounded. Boko Haram losses were not specified. A “military source in Maiduguri told AFP the Boko Haram fighters responsible were suspected to have come from Dabar Masara, an island on Lake Chad, where Barnawi faction loyalists are known to have been hiding.” The Barnawi faction of Boko Haram is separate from that led by Abubakar Shekau. Far from being cornered on an island in Lake Chad, the Barnawi faction was apparently able to mount this major assault over 130 km straight line distance from the nearest island in Lake Chad. See https://www.vanguardngr.com/2017/11/three-soldiers-killed-boko-haram-raid-borno-army/ for further information. Northeast Nigeria is facing famine, the collateral damage from seven years of Boko Haram’s deadly insurgency and a problem aid agencies have long been warning about. Alas, the time for generosity is not over. Please give generously to the organizations listed on Our Partners’ page. In the last days of July Boko Haram sent a suicide bomber to Dikwa (Nigeria) – which unfortunately is nothing new. But it also assaulted and slaughtered an oil and gas exploration team at Magumeri only fifty km northwest of Maiduguri. Some 50 persons were killed including at least 18 of the military personnel responsible for the team’s protection. Four University of Maiduguri (UniMaid) staff members including two geologists were among the dead. And then, on the first of August, a midnight raid against the Margi village of Midlu, not far from Madagali and close to the base of Sukur mountain, resulted in seven inhabitants killed together with one of the Boko Haram insurgents. Although we do not know the details of these actions, it is clear that once again Boko Haram is able to plan and execute sizable, and time critical, operations at a considerable distance from its main base of operations, presumably somewhere close to the southern margins of Lake Chad. The Midlu raid was, we may infer, mounted from the Mandara mountains east of Gwoza, frequently attacked by the air force but from which the Nigerian military has never been able to drive Boko Haram out. This mountain fastness is some forty km north of Midlu. While we don’t know whether the actions of the northern and southern Boko Haram are coordinated by a single command, it would be wise to assume this to be the case until shown otherwise. In other words, Boko Haram, despite its contested leadership and ‘defeat’ in 2015 by the Nigerian military (bolstered by S. African mercenaries, vigilantes and hunters), appears to be resurgent. How can this be so? The Nigerian government has still not realized – or at least not been able to put into effect — the old truth that infantry are required to hold territory. Instead, as the government’s recent response to an American ‘in country’ report makes clear, the police, Nigerian security and the civil defense corps are supposed to take on this role. For which they demonstrably unsuited and incompetent. This is why, as previously discussed, the inhabitants do not dare to farm, nor can NGOs operate away from military bases or when unaccompanied by armed convoys. Militarily then the Nigerian armed forces will never be able to suppress, let alone defeat, Boko Haram until their deployment across northeast Nigeria is sufficiently wide and dense to interdict Boko Haram from penetrating the villages and intimidating the populace. Equally critically, until the state and federal governments make the political moves necessary to persuade the youth of Northeast Nigeria that their futures and interests will be best served by aligning themselves wholeheartedly with the state, peace and the withering of Boko Haram are lost causes. These words are written in Western Canada where reliable information on NE Nigeria is hard to come by. I do hope that my pessimism is unjustified, but my experience of Nigeria, which goes back over half a century, gives me few grounds for optimism. May I be proved wrong. The world is facing its largest humanitarian crisis since 1945, the United Nations says, issuing a plea for help to avoid “a catastrophe”.UN humanitarian chief Stephen O’Brien said that more than 20 million people faced the threat of starvation and famine in Yemen, Somalia, South Sudan and Nigeria. Unicef has already warned 1.4m children could starve to death this year. Mr O’Brien said $4.4bn (£3.6bn) was needed by July to avert disaster. “We stand at a critical point in history,” Mr O’Brien told the Security Council on Friday. “Already at the beginning of the year we are facing the largest humanitarian crisis since the creation of the United Nations.” “Now, more than 20 million people across four countries face starvation and famine. Without collective and coordinated global efforts, people will simply starve to death. Many more will suffer and die from disease. The UN has described the unfolding disaster in north-eastern Nigeria as the “greatest crisis on the continent” – the full extent of which has only been revealed as extremist militant group Boko Haram is pushed back. It was already known the Islamist group had killed 15,000 and pushed more than two million from their homes. But as they retreated, it became clear there were thousands more people living in famine-like conditions in urgent need of help. What’s hampering aid? Boko Haram attacks, lack of rule of law, under-development. There are still areas under the control of Boko Haram, which aid agencies cannot reach. Thee have also been allegations of widespread aid theft, which are being investigated by Nigeria’s senate. Thanks to the BBC for this clear statement of the situation. Your help is needed more than ever — especially when you remember that severe malnutrition of children is almost certain to affect them, intellectually and otherwise, for life! The threat in Sukur and Madagali presently is the issue of underage girls (ages 9-15 ) strapping locally made explosive devices and sometimes with babies on their back, to penetrate places where people gather, i.e., markets, worship places, etc. Killing scores of people. It is a dangerous outcome or another phase of the Boko-Haram insurgency. The map below shows why people are starving in Nigeria’s Borno state. The areas colored red are ones to which there is no humanitarian access and the pink ones those that are accessible with varying restrictions. The presence or fear of Boko Haram is the main factor limiting humanitarian access, but it also limits inhabitants’ access to their fields. So we may interpret the red areas as those in which people’s ability to feed themselves has been severely compromised. We begin this update with a report by Saleh Kinjir, founder and CEO of the Yola-based Kinjir Foundation, to the American University of Nigeria/ Adamawa Peace Initiative (AUN/API) in August and September informing them of the situation in Madagali Local Government Area. It must be emphasized that the situation in Madagali Local Government Area (LGA), though worse than in parts of Adamawa state further south, is substantially better than in Borno State. August. For the past 2 years, no farming activities took place in Madagali. No grains for sale in the markets nor money to buy even if it was available. Food from across the border with Cameroon has been stopped by border closures. No food distribution took place except by AUN-API. The little available in the few markets open was bought up by people from Borno state (District Heads and Market Committees have now imposed a restriction on selling food items out of the LGA). The small quantities on sale are rationed. There is some recent improvement however due to the arrival of fresh crops such as cassava, newly harvested maize and potatoes. The hunger rate which was 60 % is now down to 50%. September. The situation in Madagali has not changed much over the past months. Fifty percent of Madagali Local Government Area is still ravished by hunger. On Tuesday 27/9/2016, a 100 kg bag of maize was being sold at ₦18,000 [a 300% increase over 2012 prices]. Guinea corn (sorghum) cost ₦20,000 [a 400% increase], and beans ₦30,000 [a 200% increase]. Most of our people cannot afford them. IDPs have no money to buy food. Meanwhile, in and around Yola, the price of foodstuffs has gone down by 35% since April 2015, just before Boko Haram was driven out of Adamawa state. There is little reconstruction in Madagali. A new Police Station has been built but nothing has been done in the areas of schools, health centres and places of worship. Most of our communities have suffered massive malarial attacks due to overgrown weeds and bushes that were not cleared. Children were the most affected. Reconciliation work is being carried out by traditional rulers and community based organizations. A massive tree planting campaign is also being embarked on to restore tree cover and to provide wood for fuel. Some areas closer to the Sambisa forest are still unsafe, due to the presence of a few escapees from the forest under massive attack by the Nigerian army, hunters and vigilante groups. We need food, medicine and urgent rehabilitation of public and private buildings, especially roads and bridges. The Kinjir Foundation is one of our Partners and is at present training its staff and contacts in the vitally important but till now little developed process of reconciliation of Boko Haram victims with those in any way involved with the insurgency — often victims themselves. Please donate generously. 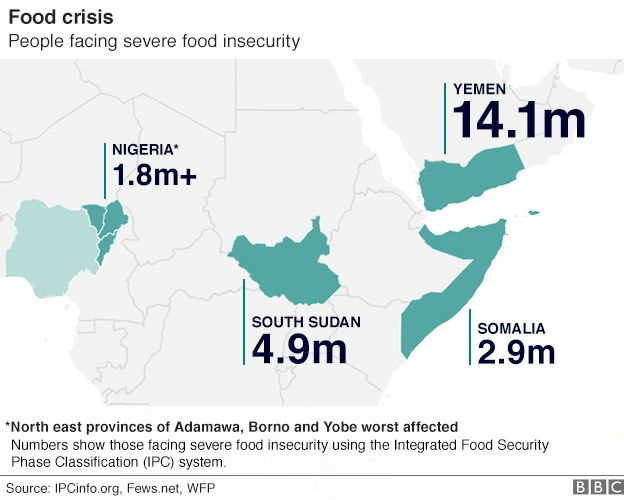 Over six million people in those parts of Cameroon, Chad, Niger and Nigeria previously affected by Boko Haram face severe hunger, Reuter reported on September 23rd. Borno state in Northeastern Nigeria in particular is experiencing a perhaps even more disastrous phase in the conflict with Boko Haram. And this despite the relative lack of insurgent activity and their continued inability to carry out mass assaults on Nigerian towns and cities. Small scale attacks do however take place, most recently on Asaka village near Gashigar, a town near the Niger border in NW Borno state. Here a convoy of eight vehicles with insurgents armed with RPGs and “heavy weapons” claim to have killed 20 Nigerian and Nigerien soldiers and are said to have stolen six military vehicles in addition to weapons before departing. Such attacks belie the “technical victory” over Boko Haram claimed by President Buhari in 2015 and help explain why there are 2.2 million displaced people in Nigeria alone. The fear generated even by small attacks underlies the growing humanitarian disaster in the Lake Chad region. Warnings of famine became common in NE Nigeria from July 2016 onwards — in this part of the world the months preceding the main November-January harvest of the staple millets are always difficult — but their food situation has been greatly worsened by a major, locally total, reduction in cultivation due to people’s fear of Boko Haram. This has prevented farmers from working their fields in the bush … and the dry season sorghum harvested around March-April is mostly grown in areas flooded during the rains that are at some distance from their towns and villages. In some areas of Borno state, the Reuters report continues, more than half the children under five years of age suffer acute malnutrition, more than 65,000 are living in famine, and over a million are but “one step away”. Why has this happened? It seems that the Nigerian army has failed to occupy the region in a manner that would allow them to suppress or immediately crush even minor Boko Haram activity. While there are bases away from the main centers, we read more of motorized sorties from bases, guns blazing to discourage ambushes, and returns to bases at night, allowing Boko Haram to terrorize and plunder the inhabitants of smaller settlements, defenseless in the face of even small groups of Boko Haram. The scale of the problem is evident in UNICEF’s recent statement that some 2.2 million Bornoans are still living in areas rendered “inaccessible” by Boko Haram.  High levels of malnutrition, malaria and spread of communicable diseases in newly accessible areas in North East Nigeria are the main health risks. With detection of fourth case of wild poliovirus type 1 (WPV1) in Monguno in Borno State on 4 October, further spread of polio virus is a significant public health concern.  UNICEF in collaboration with partners has achieved 42 per cent, 79 per cent and 51 per cent of access to water, sanitation and hygiene promotion targets, respectively.  In total 93,148 SAM children, have been admitted to therapeutic feeding programme in Adamawa, Borno and Yobe states.  Psychosocial support has reached 157,583 children among whom 84,311 children are benefitting from education services in a protective and safe learning environment.  Over 2.77 million people among the affected population have access to UNICEF supported primary healthcare (PHC) services.  The revised Nigeria 2016 Humanitarian Response Plan (HRP) is only 24 per cent funded. UNICEF has received only 25 per cent of its appeal requirements of USD 115 million. Meanwhile “a U.N. appeal for $740 million to help those displaced by Boko Haram violence [has been] less than a quarter funded.” The crisis in the Lake Chad area is being largely ignored by the world and by the media. Do please donate: we presently especially recommend the UNHCR and the International Committee of the Red Cross, the latter having, so far as we know the only appeal focused on this area. Finally, some good news: things are going somewhat better in Adamawa state. Despite difficulties that include infrastructure still unrepaired or replaced, people (even in parts of Madagli LGA, the most at risk, are growing their own food. At Sukur, Nigeria’s first World Heritage site, which suffered a major Boko Haram assault in 2014, they were able this year to celebrate Mber, the ceremony of initiation for young men. Despite the lack of basic infrastructure and services, including schooling for the young, these brave and resilient people are helping themselves and making progress. Finally, there is news from Cameroon. Hans Heungoup, an analyst from the International Crisis Group travelled for four weeks in the Far North province and reports on his findings. Besides 151,000 nationals who have become internally displaced persons (IDPs) on account of Boko Haram, Cameroon, with the UNHCR, is hosting some 65,000 Nigerian refugees (besides 270 ,000 refugees from the Central African Republic). Heungoup’s report describes the massive disruption of society and economy in the Far North and comments critically both on the “severe failings and human rights violations in the … counterinsurgency campaign” and on the government’s failure to invest in the province. February 2016. After a long period of inaction, in March-April 2015 the Nigerian army assisted by hunters and vigilantes and in conjunction with their Nigerien, Chadian and Cameroonian allies achieved substantial victories. They drove Boko Haram out of Gwoza, Bama and other towns and villages, and inflicted many and substantial losses on their forces and equipment. The insurgents were forced into the northernmost Mandara mountains, further north into the bush on both sides of the Nigeria-Cameroon border and into the environs of Lake Chad. Small groups of militants, apparently no longer in touch with Boko Haram central command, were left scattered widely in the afflicted region although some larger camps maintained their existence, at least for a time, in the Sambisa forest. Since May 2015 it has been questionable to what extent Boko Haram remains an entity capable of initiating and coordinating military action over a significant area and on a significant scale. Several reported assaults on villages are perhaps better described as attempts of isolated and ill-fed if not starving militants to obtain, usually with considerable violence, food, clothing and other necessities of life. As a result, in Borno state the fear of bombings and other terrorist acts has, despite encouragement by federal and state governments, greatly inhibited the return of IDPs to their towns and villages of origin. In the hills above Gwoza and on the plain to the east of the Gwoza hills Boko Haram appears, if not to control territory and settlements, at least to be able to prevent the return and rebuilding of communities. It would seem that in this relatively remote area the Nigerian forces of order are either incapable or unwilling to hold land and maintain order. We suspect that in Cameroon something similar may be happening on the western side of the eastern “horn” of the northernmost Mandara mountains, a region that is similarly remote from Maroua, the capital of the Far North region. In contrast many former Adamawa state refugees began to return home in May-June 2015, and some even managed to plant and harvest a crop between then and the end of the year. Such is the case, for example, of Sukur and its neighbors. Nonetheless nowhere in the region, nor in the affected parts of neighbor countries, has life returned to normal. Many mosques, churches, clinics and other public and private buildings were destroyed and are not yet rebuilt. Disastrously for the future of these regions, very few children are going to school or youths to college. So far as we know — and since the media report very little from Boko Haram-afflicted areas and usually only the bloodiest of events — the national governments have not yet initiated the policies of reconciliation necessary to reintegrate into society those many people of both sexes and a wide range of ages who were forced by violence or hunger to “join” Boko Haram. Despite being the country with the largest GDP in Africa, Nigeria does not appear to be making the moves necessary to finally defeat Boko Haram militarily and at the same time create a route through the continuing troubles and misery towards a reintegrated and just society in its northeastern states. Only that can offer its inhabitants hope for a life worth living, an improving standard of living, and a future of opportunity unthreatened by Islamist or any other form of extremism. North-eastern Nigerians still need your help and will continue to do so for a long time to come. In May 2015 we wrote: Recent and rapid events in Nigeria require revision of this section of the website. We congratulate Nigeria on the major democratic advance represented by its recent elections, and President Muhammadu Buhari on his success. However, although the context has changed, the need for humanitarian aid in north-east Nigeria and neighboring regions continues, and is more urgent than before. “Boko Haram is winning. That’s the assessment of both U.S. counter-terrorism officials and many experts who cover West Africa. After several months of optimism, and military successes by Chadian and Nigerian forces that rolled back the terror group’s gains, Boko Haram has retaken the initiative. ” That at least is the view of NBC news (http://www.nbcnews.com/news/world/boko-haram-winning-n376786) as of June 17 2015, 11:10 am ET. Between February and April 2015 the Nigerian military aided by their Chadian, Cameroonian and Nigerien allies won victories over the Boko Haram (BH) jihadi insurgency, recapturing all the major towns previously under BH control including Madagali in Adamawa state and, in Borno state, Baga, Bama and, on the eve of the elections, Gwoza, where BH had proclaimed its caliphate. Although both during and after the elections there have been a number of attacks attributed to BH, it is questionable to what extent BH remains a viable organization capable of strategic action. Does it now consist rather of a number of fragmented remnants lashing out more or less at random? It seems likely that in Nigeria many of its members are attempting to disappear or reintegrate their communities. Meanwhile others have taken refuge in Cameroon where they are still capable of murderous attacks on small communities. Time will tell, but it is both more difficult and more expensive to support 192,000 refugees who are dispersing to their scattered and devastated home communities in order to rebuild their lives and communities than it is to provide the necessities of life to the same number congregated in a few refugee camps or living with kin in major urban centers. As the UN recognizes in its new appeal, we face a new and more demanding challenge. The next paragraphs and the following section written between January and early April 2015 are intended for new readers who may know little of Boko Haram and the horrors inflicted on the inhabitants of Nigeria, Niger, Cameroon and Chad. Boko Haram, the bloodiest Islamist militancy in Africa and a self-proclaimed caliphate, is destroying the lives and livelihoods of northeastern Nigerians at an ever increasing pace — besides bombing others elsewhere. The Nigerian federal state has — at least until very recently — proved ineffectual in combating the insurgency either militarily or politically. At one time over 70% of Borno and large areas of Yobe and Adamawa states were under Boko Haram control. The tide may have turned under the combined attacks of Nigerian, Cameroonian, Nigerien and Chadian forces but the military situation is still undecided. Only recently the caliphate twice attacked Maiduguri, capital of Borno, and, no respecter of borders, intensified its assaults against the peoples of Cameroon’s Mandara mountains and northern plains. Refugees have flooded into Niger, Cameroon and Boko Haram has even attacked Chadian settlements on the shores of Lake Chad. The insurgency is now using female “suicide” bombers, including girls as young as ten, to murder innocents and disrupt the life of towns in northeastern Nigeria. In the three most distressed Nigerian states alone, some 13 million people have been directly or indirectly affected by Boko Haram and, given the destruction of crops and thefts of livestock and foodstuffs, famine and epidemic disease appear inevitable in the next months. Once the violence is under control and refugees, many of whom are now concentrated in camps in Maiduguri, Yola, Cameroon’s Minawao and elsewhere, begin to return home, humanitarian aid is going to be even more necessary — and more difficult and expensive to distribute — as the long process of rebuilding lives and communities begins. Your generous aid, guided by our research and knowledge of the area to produce the maximum effect, is urgently needed. For a case study of the ongoing impact of Boko Haram on a single community, visit the Sukur website. You may offer help or information or become a member of BHVR or make a donation at any time, but please allow us a chance to explain what we are trying to do. Boko Haram is a Salafi-jihadi militant Islamist insurgency that since 2009 has extended its power over northeastern Nigeria to the point that it presently controls almost all Borno and large parts of Yobe and Adamawa states, an area equivalent to two thirds of the United Kingdom, affecting the lives of approximately 13 million people, besides others elsewhere in Nigeria, Niger, Chad and, increasingly, Cameroon. Unlike for natural disasters such as the Haiti earthquake or Typhoon Haiyan in the Philippines, there has been no international outpouring of humanitarian aid for the victims, who are now facing, besides the immediate threat of Boko Haram murders, kidnapping and theft, the loss of the 2014-15 harvest and consequent famine. It is the purpose of Boko Haram Victims Relief to begin to counter this situation by raising funds nationally and internationally and therewith to provide relief to victims, direct and indirect, of the Boko Haram, Ansaru and other insurgencies in Central Africa, including but not necessarily limited to those affecting Nigeria, Cameroon, Niger and Chad. Relief will take the form of cash grants or provision of goods and/or services to victimized individuals and groups and to on-the-ground not-for-profit organizations. According to the Nigerian Emergency Management Agency, as of January 2015 three million victims of Boko Haram face serious humanitarian crisis. * With the recent exception of the Red Cross/Red Crescent, no major international charities have mounted special campaigns or solicited funds earmarked for those harmed by the insurgency. While aid is being provided by their kin and a variety of international, national and local agencies, including the Nigerian Red Cross/Red Crescent and Médecins sans Frontières, the amount is very limited. The total sum requested by the Red Cross for the NE Nigerian emergency amounts to approximately $US20 to fund a year’s support for each of 150,000 planned beneficiaries. Less than 30% of the funds requested had been received by 1 February 2015 — and there are believed to be 1,500,000 Internally Displaced Persons (IDP) in the area. Current security conditions make it very difficult though not quite impossible to obtain information about or to assist those surviving in areas under Boko Haram control. Meanwhile would-be donors and their financial institutions are discouraged by Nigeria’s unfortunately deserved reputation for corruption and 419-type scams. News coverage has been sparse and it remains very difficult to see broader patterns in the data available. Many potential donors are ignorant of ways of life in north-east Nigeria and the constraints of the environment, nor are they aware of the numbers of killings, kidnappings and village burnings. A persistent problem for all non-profits and charities dispensing relief is the identification of persons, groups and organizations capable of reliably receiving and managing assistance. The four directors who have carried out research within the now BH-afflicted area are well placed to assess and evaluate the varied and often erratic sources of information emanating from it. Elsewhere we suggest some basic reading. Moreover, besides our own, often intimate, knowledge of the regions involved, we have contacted numerous professional colleagues and others familiar with the area whom we access to provide us with knowledge of events and of the victims (individuals, groups, communities, non-profit organizations) to whom it is possible to send relief and who can be trusted to put it to good use. It should be recognized that BH victims are mostly villagers or the inhabitants of small towns and that most make their living by small-scale, barely more than subsistence, farming, feeding themselves and cultivating cash crops or practising part-time trades to earn necessary cash. Few such private citizens can afford bank accounts. It is therefore often necessary to send money to NGOs or people one knows personally or whose probity and need are guaranteed at one remove by someone one knows and trusts. We have ourselves sent money via Western Union to Sukur and Higi refugees in Yola and to the Kinjir Foundation, founded by a former minister in the Adamawa state government personally known to us who has set up a refugee camp in Yola. Those receiving funds redistribute them to others, usually along kin, community or ethnic lines. It is our aim to provide potential donors first with access to recent information about events in the Boko-Haram-afflicted areas, and second with a carefully considered list of potential recipients of aid. If donors wish to send aid to a particular group we will attempt to locate suitable recipients. We will also raise money directly and distribute it through our identified networks. While there are many worthy causes, it appears to us particularly important to assist victims to return to their homes as soon as possible in order to rebuild their lives and communities. Schooling, which parents have to pay for, is another high priority since a lost year is hard to recoup. Our Partners page describes our progress in identifying NGOs at scales from the international to the local capable of making the best use of your donations. Please note that BHVR neither solicits assistance from nor offers aid to governmental or religious organizations. We are happy however to offer them professional advice. Victims or their representatives are invited to contact us through our email: bokharvicrel@gmail.com.